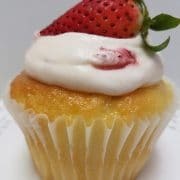 Standard size cupcakes are only $3.25 each, Mini cupcakes are $1.50 each. 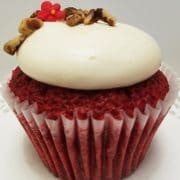 Save by purchasing a dozen: Standard size cupcakes per dozen after discount are $35, saving you $4 and Mini cupcakes per dozen after discount are $16, saving you $2. CamiCakes 2-layered, 9-inch round Cakes start at $49 and our delicious Bundt Cakes start at $29. One day notice by 5 p.m. online or by phone to pick up in store next day. 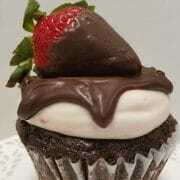 We currently ship standard cupcakes and Bundt cakes only; shipping cost subject to UPS market pricing. How do I care for my CamiCakes? Room temperature is best. Traveling with cupcakes in the car? Place boxes on the floor of the backseat in an air conditioned vehicle. How long do CamiCakes stay fresh? They are at their best the day of purchase. However, they are still delicious the next day. Can I order them in advance? Can I place an order for same day pickup? Yes, but only by telephone to the pickup location. Subject to product availability and also prepayment is required. Yes, we ship cupcakes only within the lower 48 States. Minimum order one dozen, cost $39 + Shipping (varies per recipient state) shipped in specialized package, frozen frosted on dry-ice via overnight services. Can you do cupcakes for my wedding? Yes, we can! Tastings are offered by purchasing mini cupcakes in your preferred cupcake flavor. Purchase one dozen at $15 and on final order for wedding we will deduct $15 from order cost (no refunds if wedding order not confirmed). Please order in advance, one day notice by 5 p.m. EST at preferred CamiCakes location. Can you do custom decorations? For specific occasions we offer some custom decorations, please inquire with your local CamiCakes and or email us at cupcakes@camicakes.com for further consultations. Can you write on your cupcakes? Yes, some custom decorations can be added including writing on cupcakes, however some cupcakes would not be available due to our signature designs. Please contact your preferred local CamiCakes for additional consultations. Do any of your cupcakes contain allergens? CamiCakes cannot be held responsible for any issues resulting from food allergies.